Flows were bumped up to 65 CFs at Falls Road on the Gunpowder River. Currently the gauge is down, but the water is flowing at good levels. Water temps climb from 48 degrees to around 58 during the afternoon. The change in flow and fluctuation in temps has the sulphurs hatching midday. 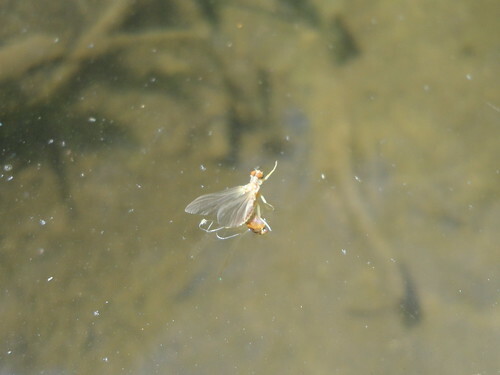 I guided an angler yesterday, and we encountered a quick sulphur hatch from 1-3pm. One of our other guides was out in the morning, and reported seeing sulphurs hatching all morning. The evening is still a good time to catch a spinnerfall. Many anglers reported rising trout after 7:30 until dark. The river is quite cold, but in this heat a few of us are wet wading. The conditions improved from the low flows last week, but I haven’t seen another angler after two days on the water. The heat may be keeping many anglers off the river, but the cold water is a great escape on a hot day. Rising trout and hatching insects are just an added bonus for those seeking refuge from unusual June weather. This entry was posted in fishing report on June 11, 2011 by Jason du Pont.